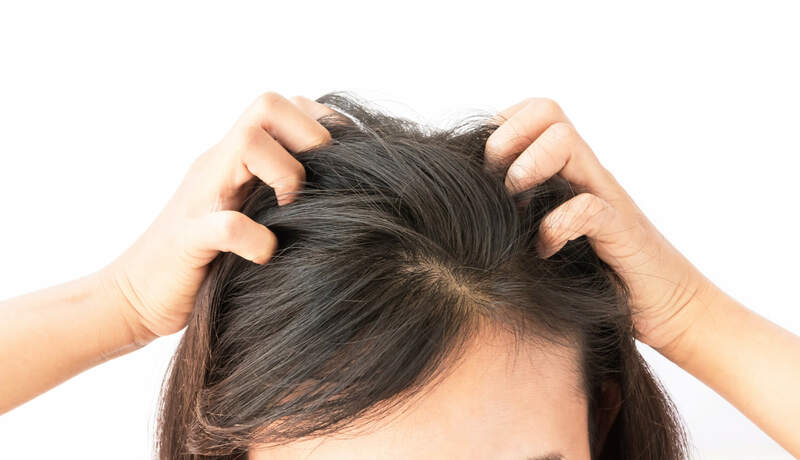 There are many obvious signs of stress, and then there are a lot that go unnoticed, such as hair loss for example, because what on earth could stress have to do with the health of our hair?! Turns out – a whole lot! The thing about stress is that when it's present, it takes a toll on your whole body and your overall health. 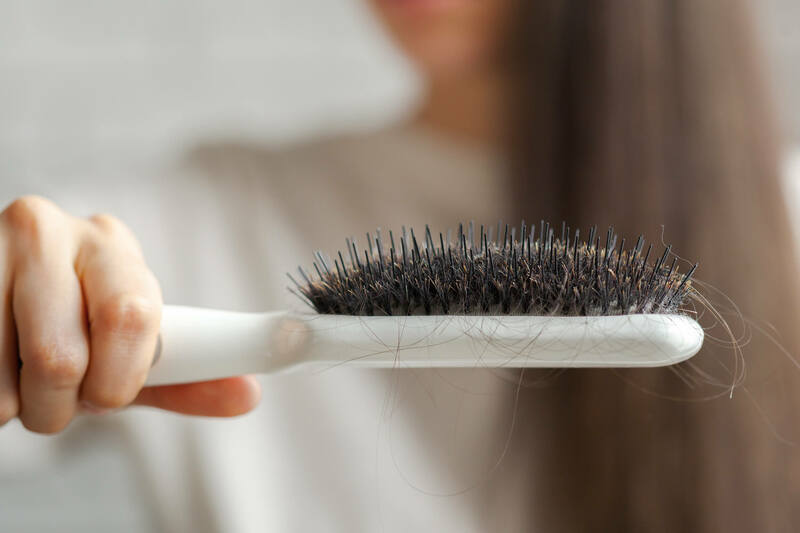 You may already know the impact it has on our digestive health and emotional health, but it can also do a number on our hair, contributing to a number of conditions including hair loss, breakage and itchy scalp. While each of these symptoms can be a sign that our body is in a heightened state of stress, it's best not to wait until these symptoms appear and take preventative measures to avoid these symptoms to begin with. However, if you are currently experiencing any of these symptoms, it could be a sign that stress is at the root of your hair damage. Do you feel like you can't stop itching your scalp? There could be a number of factors playing into this, but one of those factors could be stress! That's because stress increases the production of certain hormones and pro-inflammatory chemicals that degrade the integrity of your scalp, making it easier for moisture to be released and for irritants to get in. 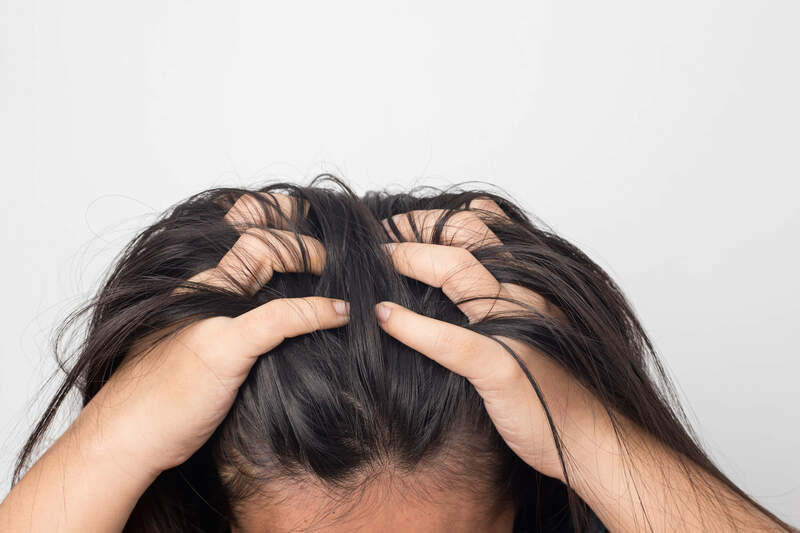 If you're experiencing itchy scalp as a result of stress, you'll want to follow the recommendations I share at the end of this post to ensure you're keeping your stress levels in check, but you may also benefit from washing your hair less frequently. Itchy scalp or not, washing your hair less is something I recommend to everyone to allow your natural oils to build up and moisturize the scalp. You may also want to make the switch to natural hair care products that are gentle on the skin and free of harmful chemicals including Sodium Lauryl Sulfate (SLS). If you're experiencing hair loss or thinning hair, stress could be at the root of it. 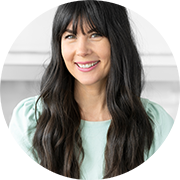 But I would still recommend that you seek out the help of a natural health-care practitioner who can help you confirm this and verify that it isn't a more serious condition, such as Alopecia Areata or Telogen Effuvium. Alopecia is typically characterized by large clumps of hair falling out and in some cases, can be permanent. Telogen Effuvium, on the other hand, is often triggered by a sudden trauma or stressor, such as sudden weight loss, metal toxicity and pregnancy. But don't worry new mamas – this type of hair loss isn't permanent and often only takes 6-12 months to regenerate after delivery. The reason why hair loss or thinning hair occurs as a result of stress is because it causes blood vessels to constrict which deprives hair follices of the oxygen, minerals and vitamins it needs for healthy hair growth. In this study, monkeys with elevated levels of cortisol (stress hormone) were shown to have more hair loss. Vitamin A – helps to produce sebum and moisturize the scalp, thus keeping hair shiny and healthy! 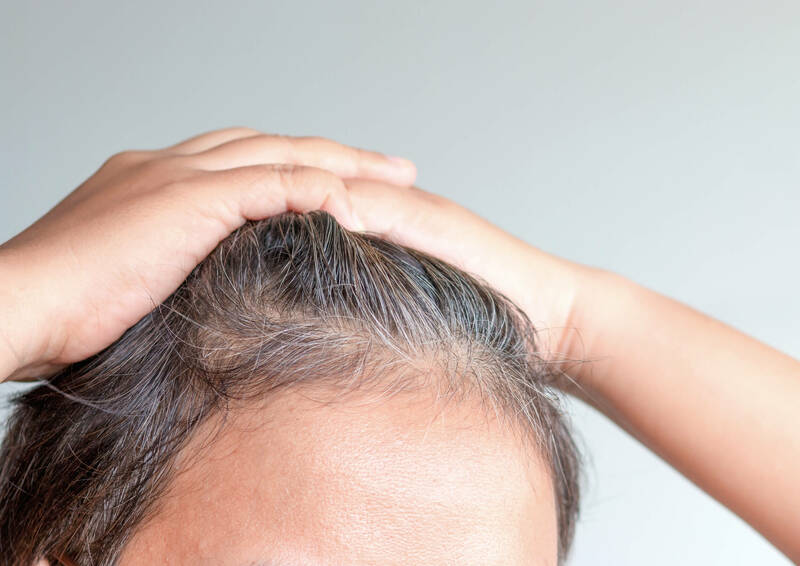 If you do happen to be experiencing hair loss or thinning hair, it may not be due to a stressor in your life currently, but from 3 months ago, as there's often a delay between the time when the stress occurs and when the actual hair falls out. While you may not be able to control the stress you experienced 3 months ago, you can control and reduce the stress in your life today and prevent hair damage from stress moving forward! As a previous eczema sufferer, I'm so sorry if you are going through this (and any of these symptoms for that matter!). I know the pain and frustation that comes with eczema, which is why I created the Eczema Healing Guide to help you heal from your eczema naturally. One of the main topics I discuss in this guide is getting stress under control, given that it is a huge contributor to eczema. The problem is that stress creates a pro-inflammatory environment, degrades the integrity of the skin and slows down skin healing; all of which are a recipe for red, itchy, patchy eczema rashes, which tend to make their appearance on various parts of the body, including the scalp. If you're experiencing eczema on your scalp, my recommendation (on top of reducing stress), would be to pick up my Eczema Healing Guide, consider doing a Food Sensitivity Test (since food sensitivities can also be at the root of eczema), emphasize anti-inflammatory foods in the dietand avoid common allergens including gluten, dairy, soy and refined sugar. Melanin is what provides our hair with pigmentation and colour, but if the individual is in a heightened state of stress, melanocytes will deplete sooner. Nutritional deficiencies can play a role in this as well, so again, it would be helpful to seek out the assistance of a natural health care practitioner to ensure that you're getting the right amount and proper nutrients you need. And don't forget to check your thyroid! When you are suffering from chronic stress, this can negatively impact your thyroid. Many women suffer from hypothyroidism which leads to hair loss and don't realize that stress plays a major role the health of the thyroid. Low thyroid function can contribute to hair loss. If you suspect this might be the case, I would suggest getting your doctor to do a blood test. You'll want to check your TSH, free T3, free T4 and thyroid antibodies to assess your thyroid function. Now that we know stress is often at the root of these symptoms, one of the best and easiest things we can do to prevent this kind of damage from occuring is ... you guessed it – reduce that stress! If you've ever finished getting your sweat on and found yourself flooded with those feel-good, positive emotions, you probably already know the effect physical activity has on lowering stress levels from experiencing it first hand! Endorphins are so powerful, that, in some cases, they can actually act as natural painkillers! Since the actual stress response is a neuroendocrine mechanism that occurs in anticipation of physical action (typically to run or flee aka "fight or flight"), it makes sense that physical activity should be a natural means to prevent the consequence of stress. I would encourage you to find something that you like though, whether it's hiking, walking, running, yoga, aerobics, swimming or another form of physical activity. That's what's going to keep you coming back to it and make it an ingrained habit you enjoy doing! We may not always be able to zip off to a yoga class or get a massage in the middle of the day when stress strikes (although that would be nice), but we can turn to deep breathing, which is just as effective, if not more, to lower stress. If you're not sure how to go about implementing a deep breathing practice, you can watch my video of how to do it over here. Often when we find ourselves in a state of stress or are feeling burnt out, it's because we've pushed self-care aside. But maintaining a consistent self-care practice is key to keeping stress at bay. Self-care can be anything from saying "no" instead of people-pleasingly saying "yes", a warm detox bath , a cup of tea, a walk in nature, a gentle yoga class or getting your weekly meal prep on to ensure you have quick, nourishing meals to turn to all week! Whatever self-care looks like to you, keep on doing that! Adaptogens are natural substances derived from plants or botanicals that help the body adapt to stress. If you were to try and find them 5 years ago, they might have been a bit more challenging to come by. But now, you can find them in powder or capsule form everywhere from your natural health food store to large-scale grocery stores. Some key adaptogens for reducing stress include: holy basil, ashwagandha, ginseng, licorice and reishi mushrooms. You might enjoy adding them to your warm beverage, blending them up into a nourishing elixir or incorporating them into baked goods! I am a HUGE advocate for spending time outside in nature! It really is my happy pill, which is why I make a point to do so every day. Simply looking at greenery and nature can help someone recover from the decrease in cognitive performance associated with stress. It can also help to mediate the negative effects of stress, including a negative mood, and enhance positive emotions! Have you found reducing stress to be helpful for the health of your hair? Share your experience below! Hello joy! Which suppléments are the most necessary, the ones that would be really hard to get with just the food we eat? I am always perplex about how much our body can actually assimilate what we give to it and specially supplements. I never really looked to much into it, just wondering. Thank you for sharing so much of your knowledge!! It really depends on your diet, your health history and your current symptoms. Are you doing my Natural Hair Care Challenge? In week 3 I talk all about "hair food". If you're not doing it this round, then please join the next time we do it. Also you can read more blogs about hair nutrition: https://www.joyoushealth.com/20426-blog-part-2-beauty-foods-for-healthy-hair Hope that helps you!